Greetings from Kenya in the precious Name of our Lord and Savior Jesus Christ. I pray and trust that this letter finds you well in the Lord. We continue to serve here through God’s grace and by your prayers. With joy, we share below some news from the field, with items of praise and prayer requests. 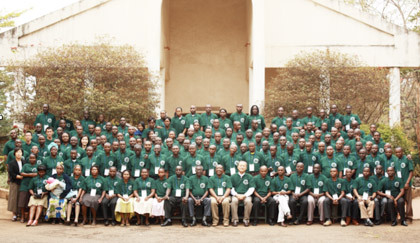 I. Bible College of East Africa Alumni Conference | Praise God for the Bible College of East Africa Alumni Conference. BCEA (Kenya) hosted a week-long meeting for alumni on August 26-30 to consider various topics under the category of facing challenges in ministry. Around 150 alumni left their places of ministry for a few days to hear lectures from their old teachers, share with their former classmates, and visit their old classrooms on campus. We praise God for the blessed time of sharing the Word, fellowship, and prayer together. We were once again thankful for the gift that was given for the making of BCEA alumni T-shirts. It is our prayer that the wearing of the same shirt signifies the unity of stance and passion for the Gospel of Christ. Before parting ways, plans were made to meet again in August of 2014. Please join us in prayer for the graduates of BCEA, that they will persevere in their ministries and service in the Lord. We pray that the Lord will use our annual gatherings to refresh and remind them of their initial call to service. II. Inaugural Service of Kigali Bible Presbyterian Church | Kigali Bible Presbyterian Church held its inaugural and first baptismal service on September 1. We praise God for the service of Pastors Joshua Yong and Eric Kambale thus far. 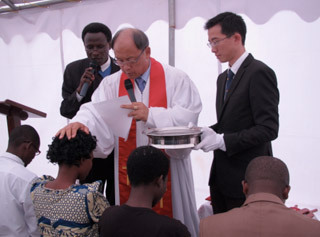 Joshua Yong is a missionary from Singapore, who served at BCEA (Kenya) for two and a half years before moving to Rwanda in June of this year. For several months, he has spearheaded the extension of the Bible College movement to Rwanda and led weekday evangelism and visitations, Saturday children’s program, and Sunday Bible study for children and adults. 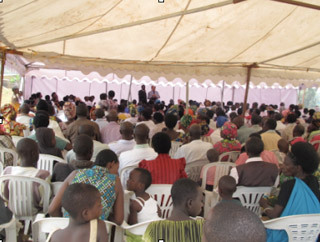 Sunday adult attendance reached 200, and after a series of classes in preparation of baptism, a date was set for the inaugural and first baptismal service (pictured right) of Kigali Bible Presbyterian Church. 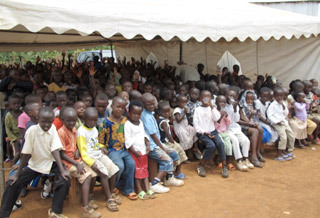 More than 400 adults and more than 400 children were in attendance to seek the Lord in prayer and to witness this blessed occasion on the campus grounds of the future Bible College of East Africa (Rwanda). Praise God for the 24 who confessed their faith publicly and were baptized. Please pray for them, that they may mature as strong Christians through the grace given by the Lord. III. Bible College of East Africa (Kenya) | Please pray for the ministry of BCEA (Kenya), as we face the start of the third academic term on September 9. Please pray that our students will arrive on campus safely and on time. May they be in prayer this term as they continue to prepare for work in the Lord’s harvest. We ask for your special prayer for a new Korean student who has joined this term, that he may adjust well to the new environment. We look forward to the visit of Dr. Suan Yew Quek, from Far Eastern Bible College in Singapore. He will be the visiting lecturer for the Bachelor of Ministry (BMin) program and will teach two weeks of intensive courses on November 18-29. God willing, on November 30, we will be holding the 43rd graduation ceremony of BCEA and the 10th graduation ceremony of the BMin program. Please be in prayer for all the students and particularly for this year’s graduates as they enter the ministry. Thank you for your prayers and support in the Lord. God bless.